Peter Vander Haeghe did something that not many people can do. He stumped me on the topic of M.U.S.C.L.E. figures. Peter took some cool pictures of M.U.S.C.L.E. figures and I wasn’t sure how to classify them on the website. Instead of worrying about that, I figured it was just better to share them. Thank you Peter! I hope every M.U.S.C.L.E. collector enjoys the as much as I did. 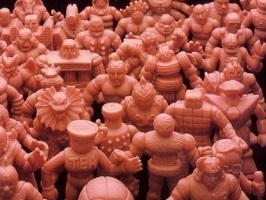 If anyone else has M.U.S.C.L.E. things to share, then please email UofMUSCLE@gmail.com. This entry was posted on Wednesday, May 30th, 2018 and is filed under UofM News. You can follow any responses to this entry through RSS 2.0. You can skip to the end and leave a response. Pinging is currently not allowed.